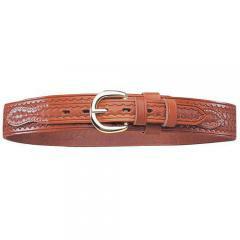 have many dress & sport belts to choose from. Features the popular Western billet design, full grain leather and the finest, corrosion-resistant hardware, attention to detail and exclusive design features put these belts in a class all their own. To stand up to the extra strain of carrying a holstered gun, these belts feature heavy weight cowhide that looks great and won't crease in your back belt loop. The buckles on this Ranger belt are cast from solid brass. Good quality leather, detailed nicely and fits well. Good belt. gives good back support. Fits the works very well with the Galco Fletch Holster.